In tone and mood, this is closer to “Pan’s Labyrinth” than to “Peter Pan,” closer to the fairy tales as originally told by The Brothers Grimm than to the lighter Disney versions. Consider this “Sleeping Beauty Take 2: The classic tale told from a darker point of view.” The writers made a number of changes to that story – some add depth and emotion to the movie, others just create the need for massive special effects. At times, the story feels under-written and the characters seem under-developed; flames are always sparking from Maleficent’s fingers, she’s surrounded by green haze; the backgrounds seem to be matte paintings, the forest creatures to have come from the mind of Maurice Sendak. Warmth and humanity feel like they’re missing; it’s clear that the director (Robert Stromberg) has a background in visual effects. 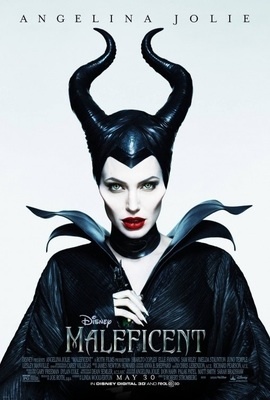 Angelina Jolie is Maleficent, of course — but Elle Fanning is magnificent; as Aurora, she brings the sparkle and charm we associate with a Disney princess; she steals her scenes from her “fairy godmother;” we can clearly understand how she could steal Maleficent’s heart. The film is a bit disjointed, but not as frightening as it looks in the trailers. While there may not be enough fun for the youngest kids, there’s enough action for the slightly-older ones – and for adults. Those who know the original “Sleeping Beauty” story well will enjoy the differences; those who don’t may enjoy this movie on its own merits. On opening night in a packed theatre, the whole audience applauded at the end. It’s a big Disney summer movie.